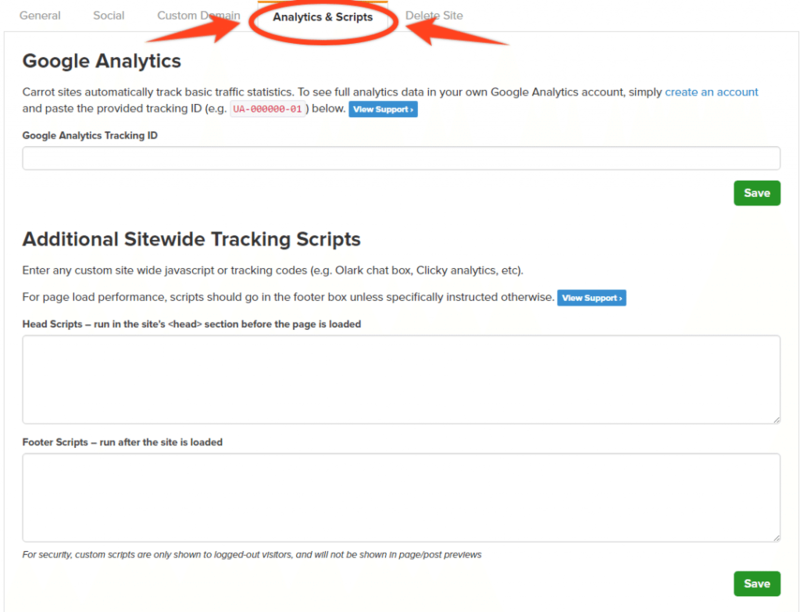 Here’s where you learn how to add Google Analytics and other scripts to your site! If you’re wanting to add 3rd party scripts to your Carrot website, we have an option that’ll allow you to easily do that without ever having to touch the code on your website. Certain 3rd party services (such as live chat, split testing and conversion tracking software, etc) require that you add a script to your website or to certain pages on your site. Follow the steps below to add a script to a single page or to your entire site. For your account security, scripts will only be shown to logged-out visitors and will not be visible in your page/post previews. Save after it’s entered and you’re finished!